The objective of Houston Motor & Control’s Boxer Motor Companion is to save operating costs by reducing energy consumption, eliminating severe starts and allowing regeneration of energy when available. HMC’s patented technology platform, The Boxer, has been verified in independent testing to start softly and improve the efficiency of oilfield electric motors in constant speed and variably loaded applications. The Boxer technology detects motor load in the oilfield pumping unit by continuously analyzing the voltage, current and power factor in order to deliver only the precise amount of energy required. 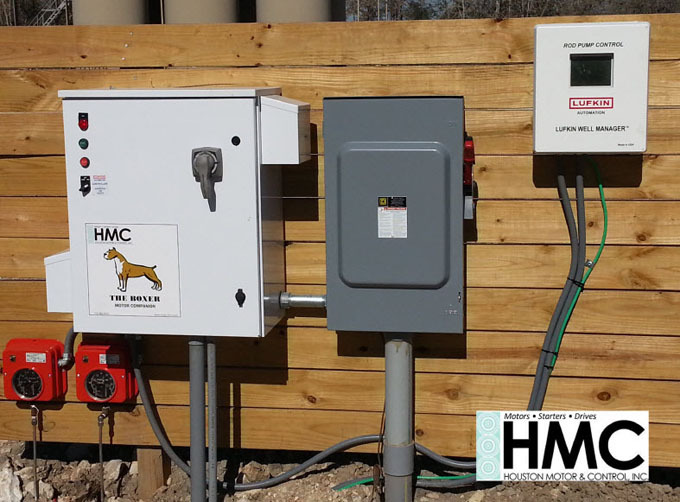 HMC’s Boxer Motor Companion utilizes patented energy saving algorithm circuits which sample current, voltage and power factor every half-cycle. When The Boxer indicates the motor is lightly loaded and running inefficiently, current is reduced to the motor, resulting in lower energy consumption costs. The soft starting feature reduces the in-rush of electrical current, thus saving equipment. The severe impact to topside and downhole equipment is avoided. Integration into new and existing units is fast and easy. No control wiring or programming required.